Lena Levin. Sinking into obscurity (after Boris Pasternak). November 2016. When we recognize that, just like the glass, our body is already broken, that indeed we are already dead, then life becomes precious, and we open to it just as it is, in the moment it is occurring. When we understand that all our loved ones are already dead — our children, our mates, our friends — how precious they become. How little fear can interpose; how little doubt can estrange us. When you live your life as though you’re already dead, life takes on new meaning. Each moment becomes a whole lifetime, a universe unto itself. I read it, I recognised the truth of it, and then I forgot. It makes all the sense in the world to live like that, I thought, and yet I couldn’t really imagine doing it — from moment to moment to moment. On the last day of November, I found myself in the local library, without any specific purpose in mind. I really wanted to walk in the adjacent park (that’s where the landscape above was painted), but it was raining, and cold — so, the library. I browsed their digital catalog, more or less at random, not searching for anything in particular — and was drawn to a somewhat mysterious title, which combined the names of Rainer Maria Rilke and Ben Shahn as authors: For the sake of a single verse: From the Notebooks of Malte Laurids Brigge. 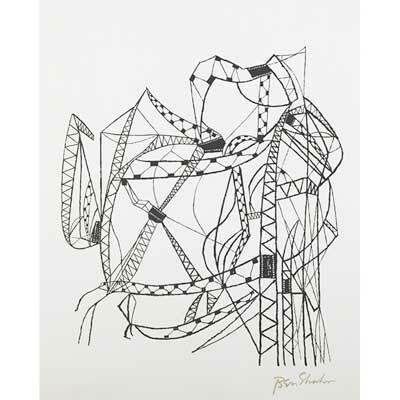 I had never heard of Ben Shahn before. Ah! but verses amount to so little when one writes them young. One ought to wait and gather sense and sweetness a whole life long and a long life, if possible, and then, quite at the end, one night perhaps be able to write ten lines that were good. For verses are not, as people imagine, simply feelings (those one has early enough)–they are experiences. For the sake of a single verse, one must see many cities, men, and things. One must know the animals, one must feel how the birds fly and know the gesture with which the little flowers open in the morning. One must be able to think back to roads in unknown regions, to unexpected meetings and to partings one had long seen coming; to days of childhood that are still unexplained, to parents whom one had to hurt when they brought one some joy and did not grasp it (it was a joy for someone else); to childhood illnesses that so strangely begin with such a number of profound and grave transformations, to days in rooms withdrawn and quiet and to mornings by the sea, to the sea itself, to seas, to nights of travel that rushed along on high and flew with all the stars—and it is not yet enough if one may think of all this. 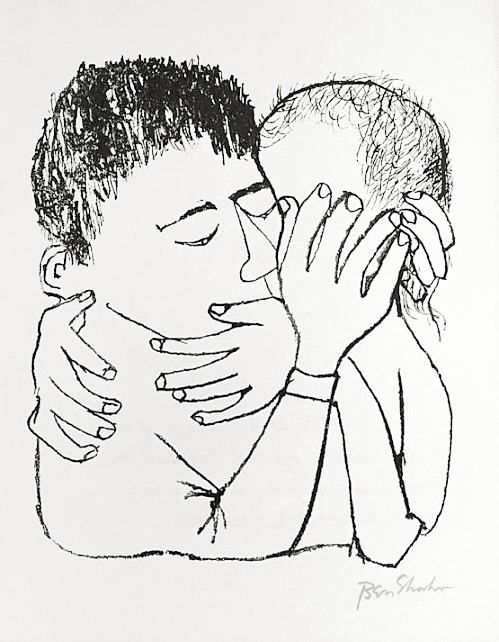 Ben Shahn… one must have memories of many nights of love, none of which was like the others. One must have memories of many nights of love, none of which was like the others, of the screams of women in labor, and of light, white, sleeping women in childbed, closing again. But one must also have been beside the dying, must have sat beside the dead in the room with the open window and the fitful noises. And still it is not enough to have memories. One must be able to forget them when they are many, and one must have the great patience to wait until they come again. For it is not yet the memories themselves. Not till they have turned to blood within us, to glance, and gesture, nameless, and no longer to be distinguished from ourselves—not till then can it happen that in a most rare hour the first word of a verse arises in their midst and goes forth from them. The library has a glass wall facing the park, and a dozen armchairs in front of it. I sat there for an hour or so with this book, turning its pages slowly, word by word, image by image, and sometimes looking at the lawn outside: the rain was ending, leaving the grass and the trees fresh, cleaned, happy. A rugged, probably homeless old man was grumbling in the next chair, with an iPad on his lap — a strikingly perfect embodiment of the spirit of our age. the constantly proliferating art literature of the late Twenties in Paris — the manifestos, the tracts, the declarations, the testaments, the confessions, the diaries, the autobiographies, the monographs, always seeking the clue, the magic key to what was what, the elusive ingredient that made art, art and not just more paint upon canvas, more filled-up space. The rain, meanwhile, was over; the clouds were receding to the background of the now sunlit lawn outside. I checked out the book, and went to the park. The deep-blue fogginess of the rain was still there in the background, blurring the boundary between the hills and the cloudy sky. 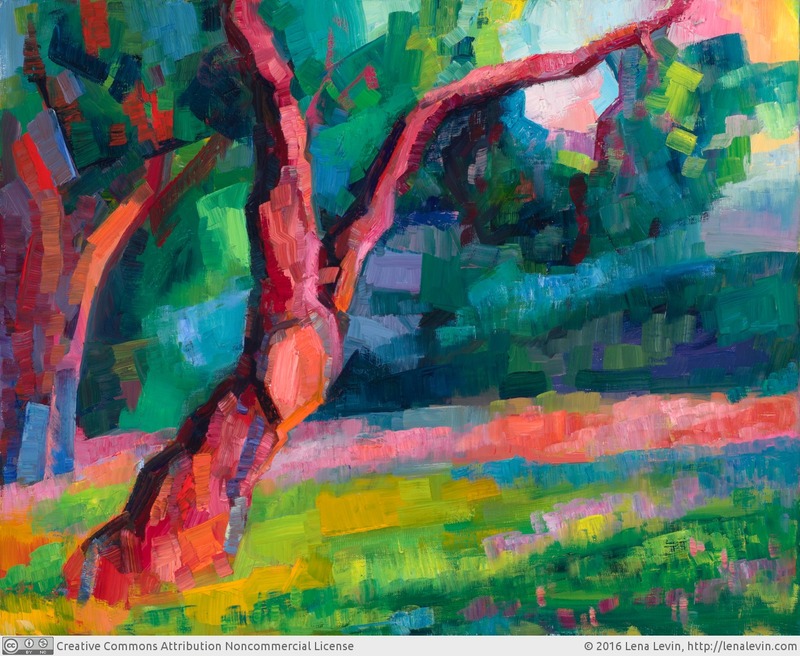 But here on the lawn, it was sunny — what painters call “magic hour”, just before sunset. There is a downhill slope towards a lake just behind the lawn, and so the sunlit lawn with its trees seemed like an island in the ocean of foggy bluish grays; the sole island of sunlight. The hazy blue obscuring the rest of the world seemed to begin just behind the edge of the lawn, as though there were nothing in the world beyond it. Just like there are people from all over the world in this town, drawn in by the intellectual buzz and wealth of Silicon Valley, so there are plants and trees from all over the world. Each has its own inborn cues of how and when seasons change, and this occasionally leads to strange confusion of colours in the fluid, uncertain weather of Northern California. On this last day of November, the grass of the lawn had the bright, fresh, childish green hue of early spring — it had just emerged from the earth a couple of weeks back, in response to rains. The trees still wore the burgundy, gold, and ochres of autumn — as though seasons were leaking into one another through cracks in the flow of time, watched by evergreens standing quietly in all this confusion. The view was so strikingly strange that, for a moment, I questioned the reality of it all. Am I in a dream? Might it be the end of the world? Or maybe I have just died, and that’s how it feels? I have never seen anything like this — not because of its beauty (and it was beautiful), but because of this unbearable strangeness, this palpable other-worldliness of the space. I almost reached for my phone to call my husband — just to check that the world as I knew it is still there somewhere. But then I noticed the usual noisy crowd of cars roaring in three busy lanes of the nearby street, and all other signs of quite mundane end of a workday on the outskirts of Silicon Valley. And then the light changed, and it was over. Rilke wrote: “I am learning to see; yes, I am beginning to see”. How wonderful! No one could take that away from him. That is the great experience of life. No one would take it away from me either. That’s the seductive promise of art: to see, and maybe one day, as an afterthought, as a ripple, to open the eyes of another to the strangeness and unbearable glory of life — perhaps through a book accidentally found on a bookstall in Paris, or in a neat, pragmatic library in Fremont, California? Is this, I wonder, how the life is if you live it as though you are already dead: each moment happening to you like this, opening itself to you freely and miraculously, unbidden, unplanned, as a whole life-time, a universe unto itself, lit by a setting sun, against the background of dark-blue fog?